At the end of February, I traveled to Boston with Ida and Eloda for the Boston Derby Dames vs. Montreal New Skids on the Block. It was my first time at a Boston home game... and Montreal is one of my favorite teams! But before we went to the game, we spent some time in Salem where we met up with Con-tagious and Jen! Salem is the place where the... Salem Witch Trials took place, but of course we found loads of derby there! Derby House (1762) - built in 1762 by Captain Richard Derby as a wedding gift for his son, a fine example of Georgian architecture. Walking around town, we all came across this picture: a dinosaur wearing roller skates, with a shark riding on it's back. OK.
Salem was pretty interesting. We went to the House of Seven Gables and got our history on! And speaking of finding derby...thanks to Twitter we knew that some of the Jerzey Derby Brigade was walking the streets of Salem. And what do ya know, we ran into Doom Hilda and some other JDB peeps! As MellFire said, "I knew you would! Roller derby takes a big bad world and makes it small and sweet! 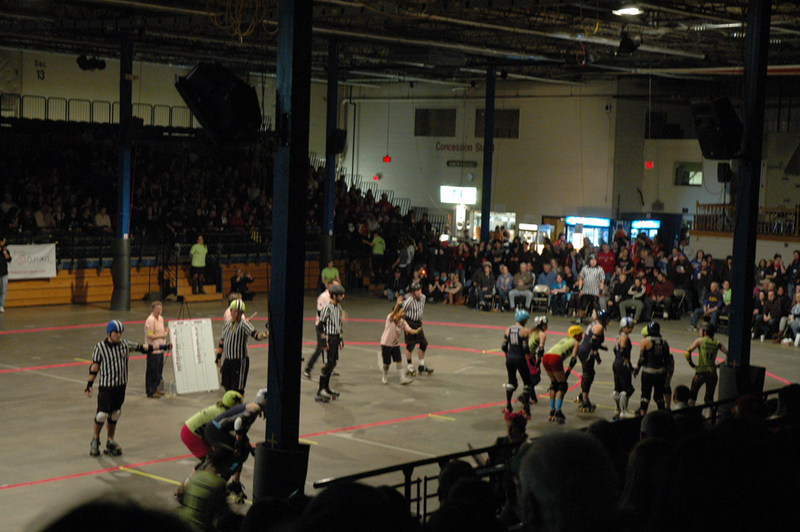 :)"
After our adventures in Salem, we headed to the Boston Derby Dames bout! The Boston Massacre took on Montreal's New Skids on the Block. It was a "wicked" exciting game - The New Skids won, 112 - 84. One thing that's pretty cool about Boston is that their fans LOVE their home teams. In fact, the A teams (Massacre v New Skids) was the opening game, with the main event being the intraleague bout - the Cosmonaughties vs the Nutcrackers (BDD's third home team is the Wicked Pissahs). The fans are absolultely nuts about the home teams. Actually, it seemed that the Boston fans were pretty smart about derby in general. I didn't overhear any conversations where one party expressed confusion. Actually, very often I heard fans discussion strategy. Impressive! The scene at the Shriner's Auditorium was true to what a Saratogian blogger, Matt's Discount Sports Blog, recently wrote about. Totally fun. The Cosmonaughties vs Nutcrackers game was really close. Points gained were neck and neck the entire bout. The final score was Cosmonaughties 102-Nutcrackers 101. From what I understand, the home teams often end with finals scores within just points of each other. No wonder that fans are bananas for derby out there. Special thanks to Boston Derby Dame, Hayley Contagious, who hosted Ida, Eloda, and I on Saturday evening. She also wrote the bout recaps for that night, so you should check 'em out! Sounds like you had a blast! Thanks so much for sharing your experience; roller derby is definite a unique sport full of passion and excitement!